Ada pertanyaan untuk Hotel Good Inn? Terletak di area Seogwipo yang menyenangkan, Hotel Good Inn memiliki posisi yang sangat bagus di pusat melihat-lihat, pantai, restoran di Pulau Jeju. Dari sini, para tamu dapat menikmati akses mudah ke semua hal yang dapat ditemukan di sebuah kota yang aktif ini. Dengan lokasinya yang strategis, hotel ini menawarkan akses mudah ke destinasi yang wajib dikunjungi di kota ini. Fasilitas dan pelayanan yang ditawarkan oleh Hotel Good Inn menjaminkan pengalaman menginap yang menyenangkan bagi para tamu. WiFi gratis di semua kamar, check-in/check-out cepat, penyimpanan barang, tempat parkir mobil, kamar untuk keluarga hanyalah beberapa dari fasilitas yang membedakan Hotel Good Inn dengan hotel-hotel lain di kota ini. Hotel ini memiliki 40 kamar yang didesain dengan indah. Banyak kamar memiliki akses internet - WiFi, kamar bebas asap rokok, AC, penghangat ruangan, meja tulis. Fasilitas hiburan hotel ini seperti taman dirancang untuk bersantai. 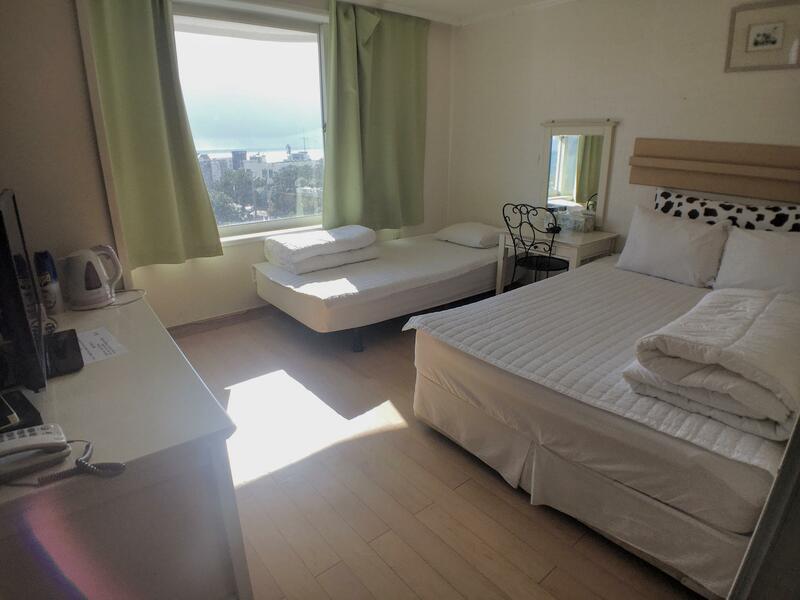 Hotel Good Inn adalah pilihan yang cerdas bagi para wisatawan yang berada di Pulau Jeju dan menawarkan pengalaman menginap yang menenangkan setiap saat. Great location as it is very near to the jeongbang waterfall. Free open air parking around the hotel. The facility in the hotel room can be improve such as the lighting as the light bulb in our hotel room is totally spoiled. In general, my stay here was nice. However, upon checking in, if you're a foreigner, make sure that you are checked in under the correct name. My first day here, someone tried entering my room without even knocking. Then, I was told in broken English that it was time to check out, even though I had a reservation for multiple days. When I went down to the front desk, no one was there, so I left to tour for the day. The next morning, I was finally given a phone call and told that I had overstayed. Luckily, I had a copy of my reservation, so we were able to clarify that upon check-in, although I had given the receptionist my ID, I was checked into the wrong room and as the wrong person. The staff was nice and apologetic, but it was a bit annoying that the staff person basically just looked at my last name and didn't verify if the first name matched up with the reservation. My other big complaint about this hotel was the lack of cleanliness, especially in the bathroom. I found strands of hair in numerous places in the room, but mostly in the bathroom. I understand the random pieces that may have missed in hard spots, like behind the toilet, but there were two in the sink and three strands in the bathtub upon check-in. The large positive at this hotel was the location. It's very close to a few bus stops, so getting around was very convenient. Also, it's close to the market, which is a great spot for cheap food/snacks. If you want to shop, the main street is lined with shops as well. Bed linen, blanket and pillows are not so clean. Smelly toilet. The only positive thing is its location, which is closed to market, restaurants and a famous waterfall in Jeju. Reasonable value for the money though. Convenient, friendly staff, lots of parking space. Very good location as really walkable distance to olle market. you can have your breakfast and dinner over there. The staff is very very helpful. Even help us to call the tourist place whether operate or not (it was raining that day). 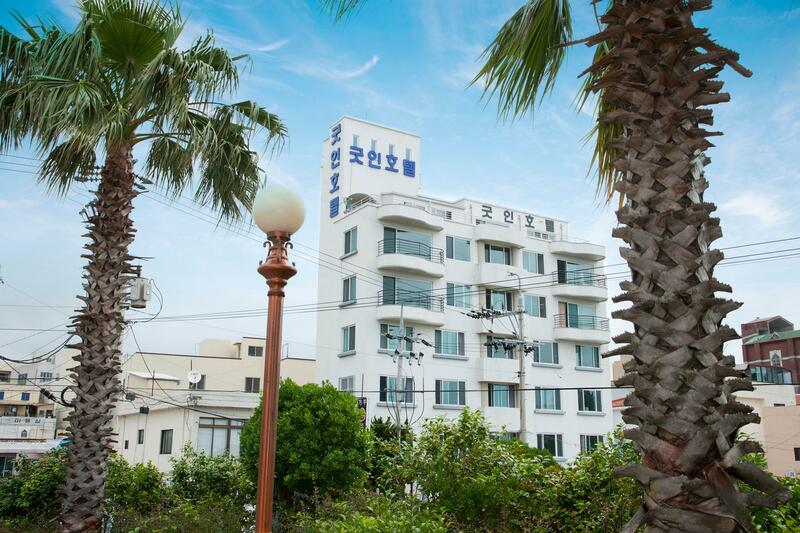 This was our 2nd hotel in Jeju for the trip. During check-in, wrong key was given to us and the room was actually occupied by someone else as there were luggage in the room, which speaks volume of its security and kind of put us off. After getting the right key and getting into the room, we were once again disappointed as the supposedly "Deluxe Sea View Double" room has got NO sea-view to speak of. The bed was also too hard for our comfort and when night falls it was too dim, but at least overall the room is clean. It is in a quite good location, which perfectly suits our driving route to get from Jeju-east to Seogwipo and is located nearby to 2 waterfalls. If it is just to sleep for a night, it is fine. The handful of very friendly staff trying hard to communicate with the little bit of English they knew and my 4 words of Korean! It's definitely a cheap central option. The rooms are old and simple with a little bit of a musky smell, but they are very clean and the beds are comfortable. Communication was not easy and therefore finding out how to get to sights etc was a little hard. All the staff besides one younger women where lovely and tried very hard to answer my questions. However, I would not stay here again if I ever returned to Jeju and would only recommend it as a cheap central option. Poor,room we're not clean, pictures are misleading: the room are actually old and shabby, room smells bad and of cigarette smoke. The room was supposed to be a Deluxe Double with sea view: the sea was barely visible, the double bed was too small to fit 2 people and in the room there was a second single be. This is not the concept of deluxe or double bed room that I have seen everywhere else. I booked the place for 5 days, I checked out after 2 nights. Never go there again! There was nothing good about this hotel unless you're on an extremely tight budget. The stay was horrible. I reserved a "Ocean View Deluxe Room," but there was no ocean view. the view was very bad. Really what you see are buildings and power lines with a sliver of some water. The pictures they show are not the real room that you will get, so basically they do a bate and sweitch on you once you check in. The staff is horrible and do not care about your needs. The first thing the lady tried to do when I checked in was to sell me a tour with some shady cab driver, which they probably got a cut of money from. The room and the hotel was just old and run down with a stinch of cigerette smoke everywhere. The furniture in the room was old and nasty just like the bathrooms. I will never stay in hotel again and can't believe Agoda would allow fake photos. Nice affordable place for a last minute dive trip. The hotel offered a comprehensive map of activities to do in the immediate area. The staff was great. Overall the stay was good. I wanted a place to stay that was within a short walking distance to the local dive shop that was not going to be expensive. The area is nice and quiet, so if you are looking for a lively nightlife you may want to stay in the city. Given the price of the hotel you cannot expect too much. There were no shower curtains and I found hair on the floors and bed. The AC in my room was also broken, but the front desk had fans available. The room itself was a lot smaller than I expected, but I was not in it the majority of the trip. You definitely get what you pay for. However, this hotel was great for a last minute trip and served its purpose. I would stay here again, but I would book the Deluxe room instead of a standard. Ample public parking space around the hotel (but first come first serve). About 5 minutes walk to Seogwipo daily market. Room was not clean. Hair on bed. Slept with own sleeping bag liner. This hotel definitely has seen better days. Location is ok. Value for money? Not too much compared to other places in Korea. But it's Jeju.